CodeWarrior® development tools are sold in suites. By purchasing a suite entitlement, you are able to register for any or all of the CodeWarrior products contained within this suite. This allows you to gain access to our entire portfolio of CodeWarrior tools across the suite you purchase. Come get on the design fast track with us. Hardware and software breakpointsFor Kernel-level debugging, CodeWarrior Development Studio Linux Platform Edition is required. This download defaults to a short evaluation period, typically 30 Days. NOTE: There is a limited number of times that you can extend an evaluation, and this option may not be available for all evaluation software. List of our most frequently asked questions in regards to licensing and registration of CodeWarrior® products. Please contact NXP support for any additional questions or problems regarding your CodeWarrior® product. If you need to register or obtain a license for your CodeWarrior® product, please visit the CodeWarrior® License Information section. These downloads are applicable for using a USB dongle to license your NXP product. You should receive documentation within your USB dongle kit that has detailed instructions for getting your product up and running with a license tied to the dongle. These downloads along with the most recent Dongle QuickStart Guide are listed below for your convenience. LMTOOLS is a graphical user interface to the license manager tools allowing setup and configuration of your FLEXlm license server. This driver is for use with CodeWarrior® Classic products on Windows. These downloads contain the necessary software to install the FLEXlm license manager. 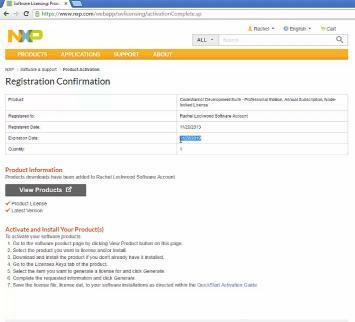 The license manager software should be installed on the license server machine which will facilitate floating licenses for your NXP product. Please locate below the appropriate download for your license server machine. If you are not sure, you should consult with your license server administrator. Below is a table that outlines which Operating System versions we officially support and test with our license manager. NOTE: Any installation or use outside of this scope will not be officially supported.